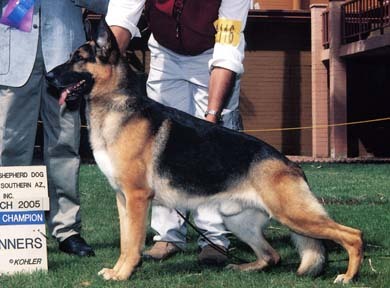 "This is a medium-sized, medium black and tan fellow with a nice masculine head. He has a good back, medium eye, short hock, and deep chest. He either tends to be close-coated, or he was out of coat. When it comes to movement, he had it all: great reach and drive, good suspension, good shoulder, and good follow through." ~ Kathy Field Casteel, Esq.